The Patient-Centered Outcomes Research Institute (PCORI) has called for comment on the new agency's draft plan. The comment period ends March 15, 2012. PCORI was established under the Affordable Care Act in part to promote comparative effectiveness research (CER). The plan shares methods through which the new quasi-public agency is expected to dispense over $600-million a year in research funds. The agency has been viewed by some in the integrative practice community as potentially more open that the National Institutes of Health to the kind of pragmatic research that may capture the whole practices of integrative care. However, the draft plan includes no references to complementary and alternative or integrative medicine, practice or practitioners. Go to this link to read PCORI's 22 page plan. Go to this site for PCORI's online public response form. Comment: Through my work with the Academic Consortium for Complementary and Alternative Health Care (ACCAHC), I have been involved with a team in tracking PCORI activity. Inside ACCAHC, we take the position that, at this point in the evolution of U.S. health care, if "complementary and alternative medicine" and "integrative medicine" or "integrative health" are not explicitly included in a guidance document, these practices and disciplines are not likely to be in the minds of readers as part of any recommendations or future actions. We have urged explicit inclusion in two prior responses and September 2011 when two of us had a chance to present to the Board of Governors. There is significant precedent for explicit inclusion. A June 2009 Federal Coordinating Council report on CER listed "complementary and alternative medicine" as a topic for CER. More importantly, the March 2010 Congressional mandate in Section 6301 of the Affordable Care Act that established PCORI explicitly states that a "state-licensed integrative health practitioner" should be among the members of the Board of Governors and that an "expert advisory panel" should include "experts in integrative health." This draft plan lacks any direct references. Time to get the language in there. Go here to comment. In the Huffington Post article The Swiss Government's Remarkable Report on Homeopathic Medicine, author-advocate Dana Ullman, MPH has again shown how homeopathy's minimal dose can somehow generate enough energy to heat up the internet. Ullman's review of the Swiss government's review had generated some 800 comments and 3500 Facebook shares as of March 3, 2012. Ullman writes that the report's authors cite evidence-based medicine pioneer David Sackett, MD in their method for choosing useful research. Sackett dismisses those who argue that randomized controlled trials are the only meritorious evidence. Writes Ullman: "Ultimately, the Swiss government's report on homeopathy represents an evaluation of homeopathy that included an assessment of randomized double blind trials as well as other bodies of evidence, all of which together lead the report to determine that homeopathic medicines are indeed effective." Those using homeopathy had 15.4% lower costs. After suspending coverage in 2005, the Swiss government has now reinstated it. Comment: Nothing stimulates the paradigm wars quite like homeopathy and Ullman's Huffington Post writing on the topic is continuously a battle ground. He pointedly opened his piece with reference to Switzerland's vaunted neutrality. Another of that country's signature attributes is now also in play for homeopathy: the report may be viewed as a Swiss bank account from which homeopathic advocates can spend to advance initiatives all over the world. Ullman's article was a first big draw from the Swiss account. "A disorder in traditional medicine, disorder (TM)*, refers to a set of dysfunctions in any of the body systems which presents with associated manifestations, i.e. a single or a group of specified signs, symptoms, or findings. Each disorder (TM) may be defined by its symptomology, etiology, course and outcome, or treatment response. "1	Symptomology: signs, symptoms or unique findings by traditional medicine diagnostic methods, including the taking of the pulse, examining the tongue or any tongue coating, abdominal examination, and other methods. "2	TM Etiology: the underlying traditional medicine explanatory style, such as weather factors (historically known in TM translations as the external contractions), emotional factors (historically known in TM translations as the seven emotions), or other pathological factors, processes, and products." Comment: Gomes is right to credit Marilyn Allen for this work. Allen has led the charge for years now to raise funds to get the U.S. acupuncture community into the room to help develop these codes with counterparts and colleagues in China, Korea and Japan. Allen is an educator and writer who also serves as director of marketing for the American Acupuncture Council, a malpractice insurance provider. Allen's view of the importance of this process is available here. Stacy you are right: Marilyn is perfect for the Top 10 for 2011 list. 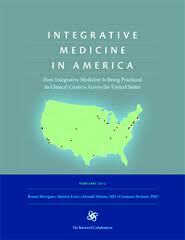 In mid-February 2012, the Bravewell Collaborative of philanthropists in integrative medicine published Integrative Medicine in America: How Integrative Medicine Is Being Practiced in Clinical Centers Across the United States. The report is based on survey-and-interview-based research in 29 health system and academic medical center-sponsored integrative medicine clinics. The 114-page document includes extensive data on types of services, conditions treated, and perceptions of leaders on where services have the most clinical value. (Topping the list was chronic pain.) The publication generated substantial media attention for the emerging field. A Huffington Post article on the study is here: New Bravewell Report a Goldmine for Those Intrigued by Integrative Medicine, Pandora's Box to Skeptics. and it will be included in an upcoming Integrator forum. An exceptional February 11, 2012 keynote by Mary Jo Kreitzer, RN, PhD, FAAN at the Integrative Healthcare Symposium (IHS) introduced participants to the Whole Systems Healing (WSH) initiative of the University of Minnesota's Center for Spirituality and Health, which Kreitzer founded and directs. The initiative, engaged in partnership with the Life Science Foundation, describes WSH as "a way of cultivating the health and well-being of individuals, communities, organizations, societies, and the environment by living and acting with awareness of the wholeness and the interconnectedness of all living systems." Among the WSH "Strategies and Practices" explored on the site are: Gentle Action, Social Entrepreneurship, Reflective/Contemplative/Spiritual Practices, Interpersonal Relational Practices, and Restorative Dialogue. A significant section is devoted to Whole Systems Leadership. Those interested can take a 50 minute module. Comment: Making headway in creating a health and wellness orientation in our culture and our medical practices requires a tough acknowledgment for any practitioner; that is, what goes on in the clinic reflects a mere fraction of what contributes to one's health or illness. One needs a systems approach. Our world needs more individuals who walk comfortably in the complexity of such a whole systems view. The integrative practitioner would seem a natural for such leadership, given the philosophy. But, as my colleague Pamela Snider, ND, likes to say, we need to "operationalize" our philosophy. Credit Kreitzer and her team, and their partners at the Life Science Foundation, for helping operationalize this connection for our community. Now, time to go take that whole systems healing leadership module! The movement toward interprofessional education (IPE) and team care took a curious organizational step in February 2012. Academic organizations representing the six most significant health professions (medicine, pharmacy, nursing, public health, dentistry and osteopathy) announced that they have formed a new organization, the Interprofessional Education Collaborative (IPEC). The release notes that "as a stand-alone entity, the new IPEC will provide leadership around national initiatives to advance interprofessional education (IPE) and share information on IPE best practices and collaborative practice innovations." The academic organizations for these six disciplines first came together under the IPEC name in 2009 to develop a document published in May 2011 called Core Competencies for Interprofessional Collaborative Practice. Comment: Normally I would greet news of collaboration between medical disciplines with unrestricted positivity. It furthers us to cross the great water out of our guilds. But the timing of this announcement looks like a power-play by a subset of professions to control what was shaping up as a broadly inclusive movement. The image is of a transition from the historic dictatorship of care by MDs to a six family, biomedical oligarchy that may make second class citizens of other professions in the whole body-mind-spirit of quality care. Here is context. Just last year, a project that has carried the IPE torch in the U.S., American Interprofessional Healthcare Collaborative, formally incorporated as a stand-alone entity. This group, closely connected with the pioneering (and Canadian government funded) Canadian Interprofessional Health Collaborative, has pushed IPE/C for years as an important shift in U.S. health care. The group, headed by Barbara Brandt, PhD, is inclusive. Among the board members, for instance, is CIHC leader, John Gilbert, PhD, a phonetician who founded the School of Audiology and Speech Sciences at University of British Columbia. The work in Canada, which Gilbert leads, has included chiropractors and midwives. The AIHC and CIHC organizations jointly promote the biennial Collaboration Across Borders conference. The conference surged in attendance in 2011 to roughly 700 from half that size two years earlier. The felt sense among the long-time laborers in this fields was that the movement had finally arrived. As a participant in that meeting on behalf of educators in integrative health care, I experienced the openness and receptivity to the integrative health disciplines participating in this nominally patient-centered movement. As one who has known what it is to labor in obscurity and without two dimes to rub together, I had hoped that the foundation community would finally bless and empower the AIHC work in a significant way. The work is important. Yet it appears that the "Big Six" professions comprising IPEC are taking that wind and inserting their professions in the movement's driver's seat. With announcement of the founding of IPEC organization came word of a May 2012 meeting. I clicked in: the May 2012 IPEC Institute was already announced as Sold Out! The problem with this limited set of disciplines is that the whole person is poorly represented. Will this group insure there is space at the table for psychologists? Social workers? Physical therapists? Chiropractors? Mental health counselors? Naturopathic doctors? Functional medicine educators? Will members of other disciplines have any say over programs and organizational directions? Or have they decided that, for now, IPE is a 6 discipline game. A colleague who is a seasoned academic veteran urged time and patience. She shared her willingness to accept this as a step in the right direction for these typically silo-ed guilds. Yes, this is good. But why begin without the mind, spirit, treatment of the body and access to community services fully included-- via psychology/mental health, PT/chiropractic/massage and social work -- not to mention the other licensed integrative practice fields. I will learn more about this soon and report back whether my concern is valid that this was less a "patient-centered" move than a "profession-centered" power play to limit and control the emergence of democracy among professions. In place of dictatorship, oligarchy. I hope I am wrong. "I believe that [ACCAHC] is playing a significant role in breaking down the dreaded silos of individual groups and are able to envision the greater, larger picture of a preferred patient-centered care model. I am hoping that this grant will allow you even more time to create collaborations between CAM [complementary and alternative medicine], integrative medicine and palliative medicine." The funds will provide staff support for ACCAHC initiatives which include, according to the release, "expanding evidence-informed education, enhancing competencies for optimal practice in integrated environments, and preparing leaders in whole person health." Comment: As a part of the ACCAHC team, I found the Westreich Foundation's grant to be particularly good news. I will personally be allowed more time to work through ACCAHC on networking and program development to help knit new relationships between the disciplines. It remains a curious thing that long-time builders of the movement for whole person, human-intensive, natural health approaches have substantially been passed over since significant philanthropy entered the integrative medicine picture 15 years ago. Money has instead gone to the last players to arrive in the game; namely, the academically-based integrative MDs. There is much good that has come of that priority. Witness the Bravewell study reported in this Round-up as an example. But what are the optimal strategies to effect the transformation toward a wellness model of care? Change can certainly come from the top down and often does. Yet strategies for leveraging transformation may also come bottom-up, through empowering the already committed grassroots. In the integrative practice movement, the most organizable grassroots are the 350,000 plus licensed CAM practitioners who are delivering high-touch, integrative care daily. What might be accomplished through better empowering these professionals? Doesn't a kind of pincer movement for integrative health make sense, enabling both top-down and bottom-up strategies? The Westreich Foundation grant represents a visionary breakthrough as a philanthropic contribution toward potentiating pent-up collaborative interest in these disciplines. The February 2012 release from Aetna and its three partners was entitled "Aetna Delivers Evidence-Based Mind-Body Stress Management Programs." The giant insurer is now offering its employees two workplace programs: Mindfulness at Work (mindfulness meditation) and Viniyoga Stress Reduction (therapeutic Viniyoga). These were collaboratively researched by Aetna in partnership with Duke Integrative Medicine and the two delivery organizations. Pilot studies found that the programs helped participants significantly reduce their perceived stress levels while improving their ability to respond to stress. Since completion of the 2010 study, Aetna has expanded the availability of the programs to all Aetna employees nationwide. Aetna also began implementing the programs with several employer customers. The insurer indicates in the release that they have "received strong interest from other customers in a wide range of sectors, including financial services and health care service providers." "Results: Statistical procedures show similar total practice costs for CAM and COM, with the exception of homeopathy with 15.4% lower costs than COM. Furthermore, there were significant differences between CAM and COM in cost structure especially for the ratio between costs for consultations and costs for medication at the expense of basic health insurance. Patients reported better quality of the patient-physician relationship and fewer adverse side effects in CAM; higher cost-effectiveness for CAM can be deduced from this perspective. "Conclusion: This study uses a health system perspective and demonstrates at least equal or better cost-effectiveness of CAM in the setting of Swiss ambulatory care. CAM can therefore be seen as a valid complement to COM within Swiss health care. The title of the article in the February 13, 2012 Seattle PI online as sent by Integrator adviser Glenn Sabin was intriguing: Trupanion Offers Coverage for Alternative Therapies. The subhead was as appealing: "Alternative therapies including acupuncture, physical therapy, hydrotherapy, and behavior modification will now be covered under Trupanion’s expanded benefits." It isn't until one gets into the story that it becomes clear that Trupanion is the nation's second largest purveyor of health insurance policies ... for pets. The firm's paradigm is one of "whole pet treatment." For example: "Alternative therapies often complement traditional medical therapies to assist in the treatment of accidents and illnesses. The focus is on individualizing treatment, treating the whole pet as opposed to specific symptoms, and promoting self-healing." Comment: I anticipate a rash of hiring of veterinarians by integrative clinic to take advantage of this new opportunity for income from covered services. "NCQA: The Medical Home Model is currently being promoted and accredited by a national, private organization called the National Committee for Quality Assurance (NCQA). Prior to the efforts of Vermont, the NCQA did not acknowledge or 'assess and score' NDs as Medical Home applicants. However, now through our state's health reform agency, we have been successful in having NCQA assess our clinics to provide scores. To date the NCQA has not formally certified NDs. The assessment is a major breakthrough and one we continue to use with our state legislature to gain recognition." Schoenbeck has led successful efforts in the state of Vermont to include NDs in insurance coverage and as primary care, Medicaid-covered practitioners. She concludes her article to her naturopathic colleagues this way: "At one time, PA's and NPs were not recognized by the NCQA. Pressure from the states and state legislation changed this policy. NCQA recognition may be a way 'in' through health care reform for NDs wanting to maintain their status as a PCP." "Public Health Concerns Due to Failure to Differentially Diagnose. ACA condemns as a threat to public health the failure by doctors of chiropractic/chiropractic physicians to adequately differentially diagnose and/or to sell treatment packages in the absence of a differential diagnosis. Such practices are contrary to the doctorate level of education inferred by our degree. Furthermore, they are contrary to the universally accepted standards of care and do not represent the customary practices of a member doctor of this organization." The meeting also included a discussion among nine chiropractic college presidents about the doctor of chiropractic as a primary care provider. Comment: The position of chiropractic doctors relative to primary care is a challenge on many fronts. On one hand, some chiropractic colleges train these professionals for the broad scope practice of what they prefer to call "chiropractic medicine." On the other are those who find any connection of "chiropractic" to "medicine" an utter violation of the profession's core values. This ACA resolution appears to be a slap to the subset of the latter group who may be adjusting without thorough diagnosis. Then again, the business model of The Joint ... the chiropractic place, reported elsewhere in this Round-up, is also likely to be a target. The low costs services will also be likely to stimulate a limited commitment to differential diagnosis. The most recent Annual Report (2010) from the National Certification Commission for for Acupuncture and Oriental Medicine (NCCAOM) provides a useful glance inside the AOM profession. At the end of 2010, NCCAOM had 16,899 Diplomates worldwide, up 17% since early 2008. Operating revenues of the organization in 2010 were $2.9-million. Total applicants dropped from 1,833 in 2009 to 1481 in 2010. One part of NCCAOM's mission is to provide "information and testimony" on various state licensing and scope issues to legislators nationwide. NCCAOM was active in 16 separate jurisdictions in 2010. The report concludes with a list of Professional Ethics and Disciplinary Cases that NCCAOM reviewed. NCCAOM chair is David Canzone, Dipl. Ac., DOM, Dipl. NBAO and the chief executive officer is Kory Ward-Cook, MT (ASCP), PhD, CAE. A January 2012 release from the National Association of Nurse Massage Therapists (NANMT) announces efforts of the organization to revitalize its work under new leadership. According to the release, NANMT was organized in 1992 and "has been recognized as the official organization representing the specialty practice of Nurse Massage Therapy." NANMT "supports the emerging trend of State Boards of Nursing to incorporate the specialty services provided by Nurse Massage Therapists as a component of the Nursing Process within the Scope of Practice of Professional Nursing." The group is presently small. A national referral directory lists just 3 nurses massage therapists in Washington, 5 in California and 0 in Massachusetts. The membership standards are certification through the National Certification Board for Therapeutic Massage and Bodywork, licensing in a state as a massage therapist or completion of a 500 hour course. Comment: As a sometimes patient, my bias is that more nursing professionals would be good at massage. It is pleasing to see that the massage education standard is not less than the already low standard (500 hours) for massage education. This is in contradistinction to the typically 150-300 hour of training typically required for a medical doctor, chiropractor or naturopathic doctor to be allowed to practice acupuncture under their MD, DC, or ND licenses - as compared to 10 times as many hours for a licensed acupuncture and Oriental medicine professional. Comment: This campaign is a textbook, profession-wide grassroots fundraising effort. The major contributors - Foot Levelers and Standard Process - are partially drawn in by the significant grassroots support. In this case, over 2000 individuals and organizations are making monthly contributions. In the driver's seat as COO of F4CP is former ACA executive director Garret Cuneo. Riley, a long-time leader in integrative medicine, is the former editor of Explore and of Alternative Therapies in Health and Medicine. Two members of his former editorial teams, Jason Hao, DOM, and Michele Mittelman, RN, MPH, are part of the new international group, as is Greg Plotnikoff, MD, MTS, FACP. At the top of the list in the Information for Authors of types of content that will be accepted for publication are "case reports, case series and case letters." The release notes that GAHM, LLC, the publisher, "building on the disruptive technologies featured in the journal," plans to eventually offer other publishing and broadcasting products, conference and collaboration services and "technology transfer and commercialization systems." The GAHM Media Kit lays out how the team plans to reach over 90,000 practitioners globally. The MD/DO/PhD portion is 40% of the anticipated audience. Comment: Riley, credited by many for coining the phrase "integrative medicine," is a veteran's veteran in this field. His work has included consulting on the minutiae of the Alternative Link coding system to helping establish an integrative center in Dubai. I've had a chance to speak informally with Riley and Mittelman about this project and am intrigued with the ways they see technology adding power to case reports. It is about time someone started a journal that has as its central focus what actually takes place in integrative clinical practice. More on this venture as it evolves. After selling the hugely successful Massage Envy firm in 2010, founder John Leonisio hit on the idea of rolling out a similar business model for chiropractic. He has done so as The Joint ... the chiropractic place. The Joint members pay $49/month for which they can receive 4 chiropractic treatments. If members want additional visits, they pay $19 apiece. Non-members who walk-in off the street in this no-appointments environment pay $29 for an adjustment. An article in Arizona Business and Money form Leonesio's home state reports that 146 franchises have already been awarded. These are open or under development in 17 states. Two St. Louis-based owners of Massage Envy franchises recently purchased rights as regional directors for The Joint for $145,000, according to this article. Comment: There appears to be a good deal of excess capacity in all of the licensed "CAM" professions. The appearance of program that take advantage of the willingness of practitioners to work for less is not surprising. What dreams are some aspiring CAMpreneurs now having about how to use acupuncturists or naturopathic doctors in a similar model? A personal appeal for subscription arrived recently from environmental medicine author-educator Walter Crinnion, ND to help save Alternative Medicine Review: A Journal of Clinical Therapeutics. The journal has been owned by Al and Kelly Czap, founders of Thorne Research which they sold two years ago. The Czaps held onto the publication and have been publishing it on their own, reportedly at a loss, since the sale. The magazine was widely distributed for free to many practitioners and is presently seeking to move to a subscription base at $40/year. According to Crinnion's note, the Czaps were targeting at least 2000 subscribers by early March. Crinnion framed the potential termination of publication as "a huge loss" for the naturopathic profession. Comment: Al Czap has always ranked among the more impetuous and influential characters in professional line supplement manufacturing for the evolving fields of alternative, naturopathic and integrative medicine. Al Czap chose the company name in the early 1980s as he wished to be a thorne in the side of conventional treatment. If the business was to be a thorne, then this journal, which grew up with Thorne, was perhaps the point of the spear. It gained PubMed searchable status early with a mix led by NDs but including MDs, chiropractors and others filling out the editorial team and advisory panel. Sun-setting is an honorable end-point. Perhaps the journal's time has come. Kara Kelly, MD is the new president of the Society for Integrative Oncology. Kelly is medical director of the Integrative Therapies Program for Children with Cancer at the Herbert Irving Child & Adolescent Oncology Center. Kelly also chairs both the integrative oncology committee and the Hodgkin lymphoma committees for the Children's Oncology Group (COG). She is an associate professor of clinical pediatrics at Columbia University Medical Center and an attending physician at New York-Presbyterian/Morgan Stanley Children's Hospital and author or co-author of over 100 articles and medical abstracts. According to an SIO newsletter, Kelly's research in integrative oncology has "focused primarily on symptom management during cancer therapy." Christine Goertz, DC, PhD, was honored by the American Chiropractic Association as their chiropractor of the year. Integrator adviser Goertz presently serves as the sole licensed integrative practitioner on the Board of Governors of the Patient-Centered Outcomes Research Institute. A decade ago, Goertz held a similarly pioneering position as the first licensed "CAM" professional to be hired by the National Institutes of Health as a program officer. Goertz day job is as vice-chancellor for research and policy at Palmer College. In a February 28, 2012 release, the American Botanical Council (ABC) announced that the American Herbal Pharmacopoeia's (AHP) Botanical Pharmacognosy: Microscopic Characterization of Botanical Medicines (CRC Press, 2011), has been chosen as the 2012 recipient of ABC's James A. Duke Excellence in Botanical Literature Award in the reference and technical book category. The book's production was led by senior editor Roy Upton, RH, DAyu, executive director of AHP. Upton was supported by an international group of editors in developing Botanical Pharmacognosy, the introduction to which is available for download here. Daniel Redwood, DC, considered "a gifted translator of complex ideas," has initiated a health policy blog as Redwood HealthSpeak: Health Policy Perspectives. Redwood has held a series of roles as a go-between between his profession and other health policy players. His site boast testimonials, for instance, from James Gordon., MD and Marc Micozzi, MD, PhD. Redwood remains as editor-in-chief of Health Insights Today, a publication of Cleveland Chiropractic College where Redwood is a member of the faculty. Redwood was a co-editor of the recent report from the Integrated Healthcare Policy Consortium based on the September 2010 multidisciplinary conference of integrative health leaders called The Affordable Care Act and Beyond: A Stakeholder Conference on Integrated Healthcare Reform.